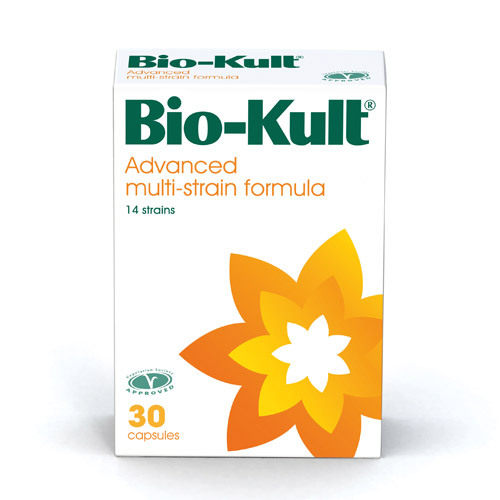 Bio-Kult Advanced Multi-Strain Formula is a unique multispecies, multistrain formula with 14 strains of beneficial bacteria. This means that Bio-Kult can deliver high concentrations of beneficial bacteria to the colonisation sites in the gut - and therefore be able to help a more diverse range of digestive concerns. This box of 30 vegicaps is an ideal travellers pack. Concentration of 2 billion microorganism per vegicap is guaranteed throughout the shelf life. Bulking agent: microcrystalline cellulose, live bacteria (see contents), vegetable capsule (hydroxypropyl methylcellulose). 1 - 2 vegicaps once or twice daily with food. Take 4 vegicaps daily, ideally at a different time of the day from the antibiotics. Continue taking for at least 2 weeks after completion of the antibiotic course. 1 week before travel follow guidelines for general use. During travel take 4 vegicaps daily. Continue to take for at least 1 week following the end of travel. Bio-Kult is suitable for use during pregnancy, but we would always suggest consulting your doctor or healthcare practitioner before taking any food supplement. May contain soya and milk as these are used in the growth media of the strains. Below are reviews of Bio-Kult Advanced Multi-Strain Formula - 30 Capsules by bodykind customers. If you have tried this product we'd love to hear what you think so please leave a review. Having problems with my digestion this product has really helped. Amazing product, have noticed a difference straight away. My stomach feels and looks much flatter and have less discomfort. Taking one star off for packaging of the pills as it cannot be recycled. Really good probiotics. Helps re-establish the gut flora that has been depleted by chemicals, mercury and sugars. Especially good if you've had gut dis-biosys. 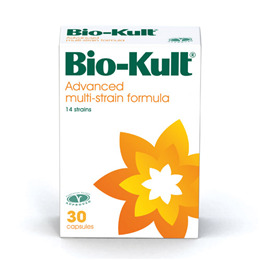 Bio-Kult can deliver high concentrations of beneficial bacteria to the colonisation sites in the gut - and therefore may help a more diverse range of digestive concerns.